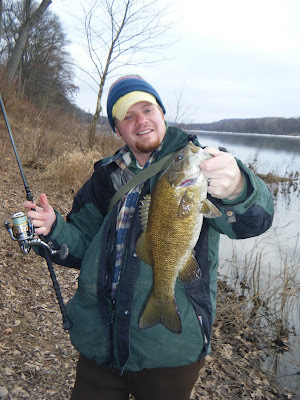 It has been absolutely frigid lately... not exactly great fishing weather... But as luck would have it, we did have a slight warm up this past week on Wednesday and Thursday-- enough to make fishing bearable. Fortunately for me, my scheduled days off were timed just right for my Dad and I to get in our first trip of the new year (and the new decade, for that matter). 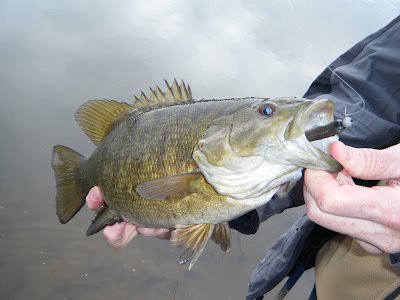 Thursday morning we headed to the river with hopes of finding a few smallmouth holed up in the eddies along the riverbank. The firs t spot we checked turned out to be iced up too badly to fish, but after relocating we found a nice stretch of open water and fortunately for us, we caught a few fish. We didn't catch a lot, but found just enough to keep our spirits up and our hearts warm enough to continue fishing for a few hours. At the end of our outting, Dad had out-fished me with 5 bass to my 3. He also landed the nicest fish of the day--a fat 18 incher that had a huge head and a scrawny tail. 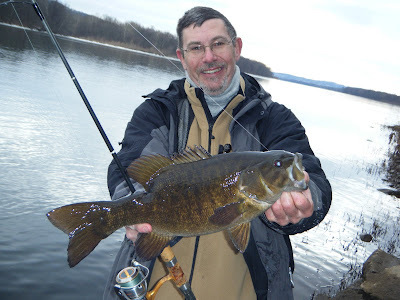 Along with the smallmouth, we also caught quite a few fallfish and a couple of carp as well. All the fish came on jigs and soft plastics. Right now temps are back down in the 20s during the day and possibly the single digits at night. It is cold out! The forecast is looking promising however, with temps in the 40s for the upcoming week. Hopefully the ice will stay off the river and we'll be able to get out a couple times next week. Until then, good luck staying warm and here's to hoping the weather man's predictions are right on the money for this upcoming week.